Here we go again. I am writing to you from the radiotherapy waiting room. I’m writing as a distraction because I am on my own and extremely terrified, I’ve spoken to lots of people and I’ve done lots of research, I am fairly sure I understand the process and I’ve spoken to a lovely friend who has given me lots of good advice, but I’m still scared. I wish I didn’t have to do this, but I know it is for the best. Today is my first session, it should have been at 10.30am, it’s now 11.44am and I haven’t seen anyone yet. With 14 more sessions to follow this one I am definitely going to be (even more) sick of this place. To all of the kind and generous people who will be taking care of Filly over the next 3 weeks – thank you so much and I’m really sorry if I’m ever late to pick her up. You’ll have loads of fun, she is an total chatterbox now and an absolute joy to be around. It’s been an incredibly busy few weeks since my operation. I think my recovery went fairly smoothly with only one unexpected trip to the breast clinic when I had (apparently) over done things and I developed a touch of seroma under my arm (a build up of fluid, similar to a blister). I’ve had a couple of blissful weeks where I didn’t have to attend hospital at all, although I will never be able to get away from my diagnosis as I take medication each day and there is barely a day where there isn’t an NHS letter with another appointment on the doorstep, and that’s without mentioning the giant scar across my chest that will forever be a reminder of this time. The week before last I was in hospital every day for a scan or an appointment, it’s enormously tiring as I do still get quite stressed and worried the night before appointments and on the day too. I try really hard to keep my emotions in check because I understand the negative impact stress can have on my body (and also my family and friends’ sanity), which is why I’ve taken up yoga again. Yoga has been something I’ve done for many years and I find it great exercise and one of the only things that truly calms me down, I can be a worrier and am fairly highly strung at times (not my words, the words of my family!) Yoga has also helped me regain a lot of movement in my arm and shoulder and hopefully it can start to assist in shifting some of the bloody steroid / chemo fat – now I’m feeling stronger I’m determined to get back my my usual, fit self. I’m not sure that everyone will understand but the weight gain from treatment really frustrates me and I regularly feel quite down about it, especially since I’ve lost lots of muscle tone – my riding Blue is a little like Filly’s favourite rhyme: ‘jelly on a plate, wibble, wobble…..’ it’s just another thing that cancer has affected and I desperately don’t want my world to be upside down and all about cancer for longer than it absolutely has to be. It’s going to be a slow process to regain strength and muscle and to lose weight, especially with radiotherapy taking up every morning for the next 3 weeks, and then in the afternoons I have Filly, the dogs, the house etc all on my own; the thing is I’m just losing patience! As time moves on and I’m further away from my last chemo, I am starting to feel a bit stronger mentally too (today is an exception!) although I still have wobbles when people try to talk to me about the future, I’m very much a live for today lady at the moment. And that has been my attitude during my recovery from chemo and surgery, I’ve tried to make the most of every day (and weekends with Ally). We’ve had some fabulous days out, and the sunny weather certainly helps, although because of chemo, I’m the one slathered in factor 50 with long sleeves and a hat on. We’ve been to the Bird of Prey centre where we flew some incredible, stunning birds and Filly became firm friends with an owl called Desmond. We’ve had too many picnics to mention and spent on average 3 hours a day in our paddling pool. As my immune system repairs itself after chemo, I’m now able to properly cuddle and play with Hartley and Clarence again too, I missed their cuddles so much. One of the best days was finally getting back into the saddle with Bluey; he was an absolute star and we had a wonderful ride with Mrs W and Ella. Mrs W and I talked the ears off Blue and Ella so the horses were happy to get home to their treats (liquorice swirls). I’ve even had my first haircut of the year, it was so nerve wracking, I wasn’t sure if my hair would suddenly all fall out, thankfully it didn’t, but It did feel amazing to have a little bit of pampering and I’ve never felt better coming out of a hairdressers. My hair has still thinned a little, but I am beyond grateful to the technology and to Paxman scalp cooling for providing the equipment that meant that I got to keep my hair. My new hair do and I did our first Cancer Research Race for Life post diagnosis, I have participated in many previous RFLs before, but this one was very different. It hadn’t really crossed my mind to do it this year, but then some very kind friends of mine (Mrs S and Mrs P, and Mrs P’s lovely daughter) said that they were going to run it and that they were going to put my name on their race numbers – there is a space on the numbers that says ‘I am racing for….’ I hate to miss out on anything so I asked if I could gatecrash and go round with them, they very generously let me join their team. The start of the race was very emotional for me, it was quite overwhelming to be surrounded by people whose loved ones had passed away because of cancer, and I couldn’t help but think about my own mortality, again. 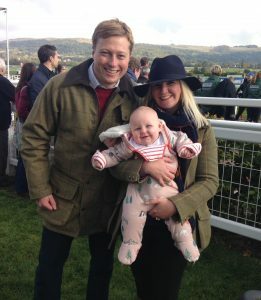 The race was around Cheltenham race course and although we certainly didn’t set any racecourse records (it was also 30 degrees) we had a great time and I certainly felt like I had achieved something at the end. After the highs of RFL, my haircut and just being able to be a fully functioning mummy to Filly again, the time came to start preparing for radiotherapy and my first Herceptin injection (they had been put on hold during recovery from surgery.) The prep for radio’ involved CT scans and also my first 3 tattoos – the tattoos are 3 small marks put onto the body so that its easy for the radiographers to line us up with the big, scary machines that delivery the radiation. As a reward for being brave when having my CT scan and tattoos all by myself and for being brave again when I had my, really painful, Herceptin jab in my leg, and subsequent reaction which put me in Oncology A&E for the second time; we decided to go to Watergate Bay in Cornwall for the weekend. It is my favourite place and was a perfect tonic to the busy week, the weather was so nice that we spent all weekend on the beach, I even went for a swim in the sea which was delightful. When we returned from Cornwall it was the week of my Riding for the Disabled group’s 60th anniversary celebration and visit from HRH The Princess Royal, Princess Anne. My fellow trustee and great friend, Mrs C, and I have been organising this visit for months, in fact the visit was confirmed on the day that I told Mrs C about my diagnosis, it has always been something for me to focus on and look forward to. I am very proud to say that the visit went without a hitch, I had the honour of showing HRH around, introducing her to the rest of the trustees, and talking her through the display that our riders did. HRH was an absolute pleasure to chat to, she’s very funny and extremely knowledgeable about horses and the RDA, so it was rather like talking to a friend, who happens to be a princess! ….and look, no mention of food. It must be the worry of today, normal greedy service will resume next time! Previous Post Monday 21st May – a sharp scratch and count down from ten….